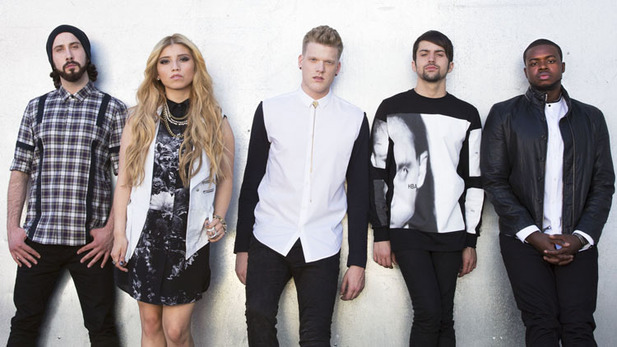 SnapCacklePop: Pentatonix give a capella a whole new groove with Tink..! Pentatonix give a capella a whole new groove with Tink..! Something different for today with a cappella group Pentatonix releasing their eponymous debut studio album that is anchored by their incredibly smooth single, Can't Sleep Love, which receives a sweet upgrade today thanks to Chicago rapper Tink. We're inclined to agree as Tink rolls through near the end of the video and delivers a verse that's as melodic as it is dope. She plays up the love angle in her own clever way ("You wanna taste you better be bringing more to the table"), and flexes her vocals to the point that she could be the honorary sixth member of the group. At the very least, Tink's inclusion gives this already infectious single more juice. The Tink-assisted version of Can't Sleep Love comes free when you pre-order the deluxe edition of Pentatonix's upcoming album, which is due out Oct. 16.